Joe Izen, principal investigator for UT Dallas' High-Energy Physics group, entered Banjo Hangout's Banjos in Unusual Places challenge and won third place out of 28 entries. In Izen's video, he plays Red Hills Polka and Chinese Breakdown on his banjo in the ATLAS cavern. 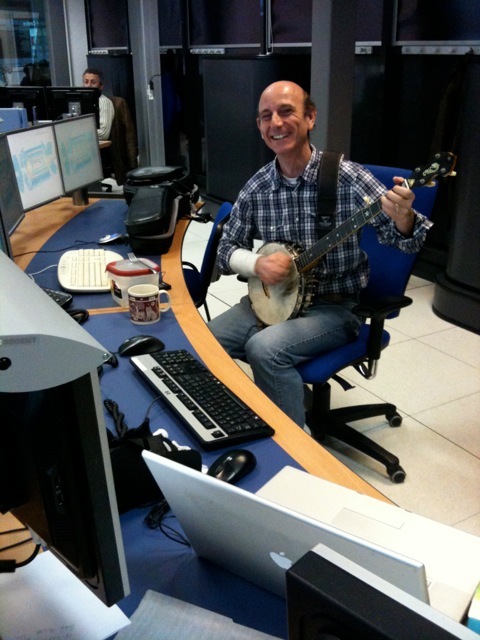 Izen picked up the banjo in the 80s when he was a PhD student working on the CLEO experiment. He played during night shifts at CLEO and later in other experiments he worked on, most recently in the ATLAS Control Room at CERN during the Large Hadron Collider's first run. "Around 4 a.m. when the body clock starts to go to sleep, if everyone was okay with it, I'd play my banjo," says Izen. Izen's band Squirrelheads in Gravy has two tracks included in Resonance, a double-CD featuring music of physicists working on the ATLAS experiment, the proceeds of which help to fund the Happy Children's Home in Pokhara, Nepal. Banjo Hangout runs a challenge every month, and Banjos in Unsual Places was its April edition.